Stocks treading water here ahead of a monster week for earnings, with a 140 S&P 500 companies set to report. Global stocks trade mixed, with modest gains in Asia and a dip for European benchmarks, as investors return to the first full trading day following last week's Easter break. 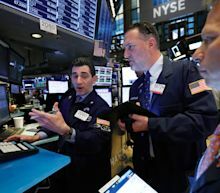 U.S. equity futures suggest little change on Wall Street ahead of earnings from Verizon, Procter & Gamble, Coca-Cola and Harley Davidson as well as April services PMI data at 9:45 Eastern Time. World stocks were mixed on Tuesday ahead of the release of U.S. housing data and more earnings reports. Oil prices soared to their highest level since October on supply fears, after the Trump administration said it would soon impose sanctions on all buyers of Iranian oil. Traders are waiting for a slew of U.S. earnings reports from big companies such as Twitter, Facebook and Microsoft starting Tuesday. Days later, he appeared to send shockwaves across Wall Street with a suggestion that the European Central Bank should consider buying stocks as a form of additional stimulus rather than sticking to the playbook of purchasing debt only. Just as he’s looking beyond just bonds for his new fund, Rieder thinks Mario Draghi and his successor should consider doing the same.